"Delicious side dish! No longer than 15 minutes prep AND cooking time. Buttery and sweet. Almost as good as dessert! A must-try!" 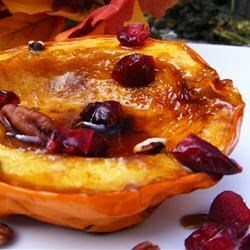 Place both halves of the squash cut side up on a microwave-safe plate or dish. Put 2 tablespoons of butter, and 2 tablespoons of brown sugar into the cavity of each half. Cook for 8 to 10 minutes in the microwave on full power. Rotate the squash a couple of times to ensure even cooking. When the flesh is soft, scoop out soft flesh with the sugar and butter, and place it in a bowl. Mash it a little to blend the ingredients. Serve in a bowl, or your could even serve it in the shells. Watch how to make this delicious side. This is delicious and so quick and simple to make.